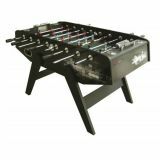 American Legend Advantage Foosball Table with Goal Flex Technology, 56"
American Legend Charger Foosball Table, 52"
This 52" foosball table has 3/16" MDF playfield, 5/8" apron, 1/2" hollow rods and 3-3/4" legs. Chrome finished leg cross bar. 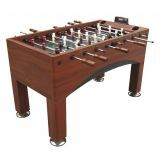 American Legend Manchester Foosball Table, 55"
This 55" foosball table has wood handles, 2 cup holders, 3/8" playfield, 1" apron, 5/8" solid rods and 4-3/4" leg leveler. Chrome-finished leg cross bar. 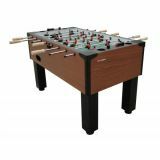 Atomic Gladiator features 3/4" MDF playfield, octagonal solid wood handles, traditional style men, internal ball return/ball entry, solid wood slide scoring, nylon rod bushings and more. 15"x2" MDF apron, 5/8" steel chrome rods; includes 4 balls. Eurostar has 3/8" MDF playfield, 14"x1" MDF apron, 5/8" steel rods, 5.25" tapered H-leg. 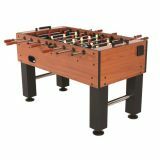 Features rubber octagonal handles, European style men, chrome bead manual slide scoring, internal ball return/entry/side return & more. Includes 2 balls. 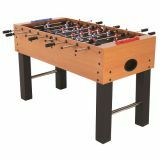 Pro Force has .5" MDF playfield, 13-7/8"x1" MDF bamboo apron, 5/8" steel rods, 4-5/8" L-style leg. 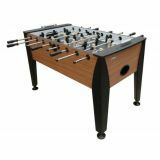 Features octagonal rubber handles, internal ball return and entry, manual slide scoring, robot style men and 3.5" leg levelers. 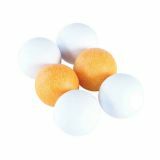 Includes 4 balls.